Need a hydration pack for the new 2018 season? Then start with this CamelBak Franconia LR 24 review, this is a really versatile daypack with an excellent suspension system and ventilation. CamelBak Franconia LR 24 100 Oz. Crux LR lumbar reservoir 3 L is included. Quick Link system for the water hose. Great ventilation due to a trampoline-style back panel. Reservoir compression straps on the sides of the pack. 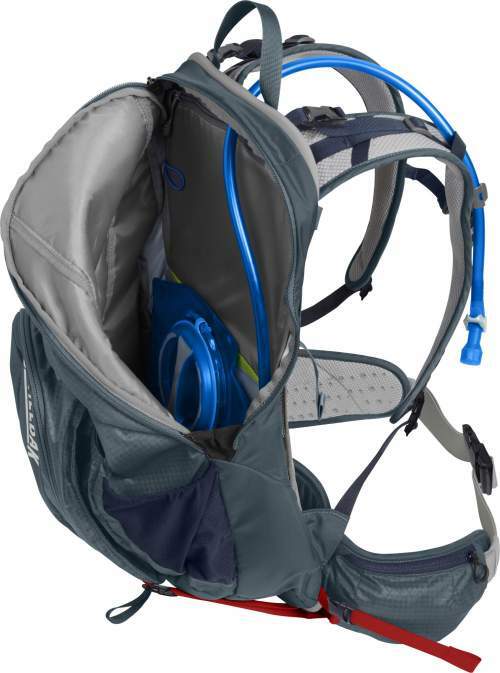 The CamelBak Franconia LR 24 is a men’s version of the packs that also include its women’s counterpart the Sundowner LR 22 Hydration Pack. These are really nicely designed packs with a great suspension system. The focus here is on its hydration features, so let me say a few words about this first. So the idea is to have the heaviest part of the stuff in the pack (and this is the water of course) as close as possible to your body’s center of gravity. Now, during the tour, the amount of water in the reservoir is supposed to change, you will be drinking it of course, so they have introduced special straps on the sides of the hip belt so that you can compress the reservoir. In this way, you stabilize the load on the go. A clever system indeed. You can route the water hose on either side of the harness. There is a Magnetic Tube Trap system which keeps your tube secure and accessible when you need it. In addition, you also have the Quick Link system in place – this means that the hose remains in place when you take the bladder out to refill. Now you see the meaning of the words Low Rider. The reservoir is completely on the bottom. The central part of the suspension here is its tensioned trampoline style mesh. It completely separates the pack from the body so you have a free air flow in all directions. This is the best system for smaller and mid-range packs, introduced by Deuter a few decades ago and used now by many brands. Very good suspension system with an excellent ventilation. Note that you don’t have torso length adjustability. It would be better to have it, but this is frequently so in the packs of this size, and with such a suspension system in particular. You will see some similar examples in the comparison table below. There are many external pockets and compartments here. So to start with the hip belt where you have dual zippered pockets, and on the sides, you have dual stretch mesh pockets. There is one great front zippered pocket with several internal organization pockets, and behind it, you have a stash pocket secured by side straps. There are also two zippered panel compartments for your gear and for the reservoir. Numerous pockets and attachment elements. Type: hydration pack for men. Hydration reservoir: 3 L (100 fl oz). Reservoir type: CRUX LUMBAR Reservoir with Quicklink System. Volume: 21 L (1250 cu in). Weight: 1.2 kg (2 lb 10 oz). Size: 53 x 29.5 x 31 cm (20.9 x 11.6 x 12.2 in). Torso fit: 43 – 53 cm (17-21 in). Waist fit: 76 – 127 cm (30 – 50 in). Here I give the Franconia LR 24 side by side with two other hydration packs, all with reservoirs included, so see how they compare. To read more please follow the links. 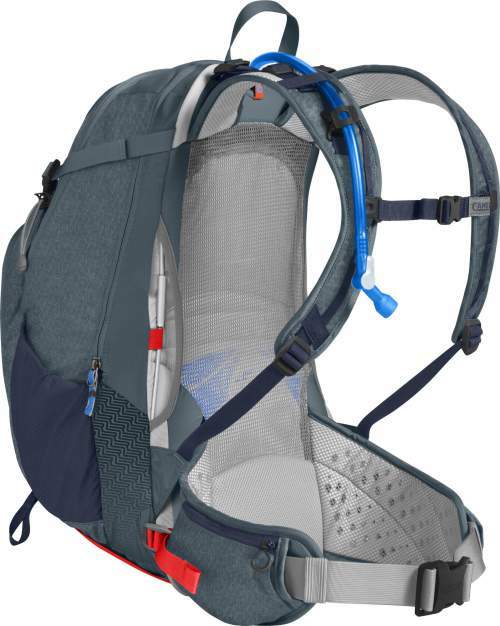 In the conclusion of this CamelBak Franconia LR 24 review, I would stress that this is a quality and very reliable pack with a true bonus reservoir. The ventilation is excellent as it is based on the tensioned mesh system. All in all, a nice daypack for a variety of outdoor activities. I can fully recommend it. Thank you for reading. 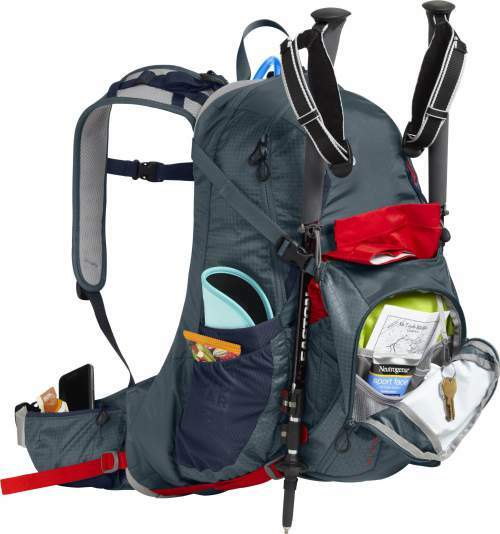 If this pack is not what you want, just check around in the packs below 35 liters, there are many great models reviewed. In particular, check this Gregory Inertia 25 with the reservoir included. 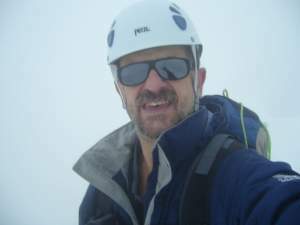 See also my list with best hydration packs. In the case of questions or comments, please use the comment box below. Have a nice day.